Welcome back to Johnny Reads and This Week in Books. This week I’m talking about Amazon’s Bosch. Bosch is the show adapted from Michael Connelly’s bestselling book series that follows LAPD detective Harry Bosch. But this is not your typical crime show. Not even close. Bosch is excellent. Now watch so I can tell you exactly why! Have you watched any of the first two seasons of Bosch? Or are you a reader of the books? What Would you do if you Didn’t Have Books? I’d just die. Okay, kidding. Honestly, I’d pretty much be exactly the same. Shocker. I like reading and books and everything that goes with them, but I already spend many more hours in front of my TV than I do reading or talking about books. Y’all know I watch every single game of the Astros, Texans, and Rockets. That’s a lot of hours. And that doesn’t even include all the nationally televised games that don’t include any of my hometown teams. Besides my obsession with sports, I like TV shows. I watch a million different shows. I usually have something set to record every day of the week except for Saturday. And there’s Bosch on Amazon and House of Cards. I just can’t get enough TV. So if I didn’t have books I’d just find my entertainment elsewhere. Because at the end of the day that’s what reading is to me, entertainment. But what would YOU do if you didn’t have books? As you well know, Fifty Shades of Grey is officially out today. Oh brother. All the moms and teens are likely flocking to their local movie theater this weekend to watch the movie in the same auditorium as a couple hundred other people. I just feel bad for the guys who are being dragged alongside. Moving on. Anyway, there’s another series adaptation being released the exact same day and I assure you that it will be significantly better onscreen than this other crap. So what am I talking about? Bosch! It’s the Amazon Studios adaptation from Michael Connelly’s bestselling Harry Bosch series! I’ve written about it twice before and its release is finally here. The first season consists of ten hour long episodes and it’s Amazon’s first foray into the hour long drama that we see basically everywhere else on TV. The series will follow LAPD detective Harry Bosch during a tumultuous time. I won’t say any more because either you’re going to watch it or you’re not and it’s not my job to do the convincing. You’ll be able to stream all ten episodes of Bosch starting today in the US and if you’re interested you’ll have to see when and how it’s available in your country. Just a little perspective, the pilot episode that helped make the series a reality currently has over 13,000 reviews on Amazon and a ridiculous 4.7 out of 5.0 rating. This is not your typical cop show. You have to be an Amazon Prime member to watch. You can read more about and watch the show here. Bye now, I’m off to see how quickly I can get through all ten episodes! I have two posts that talk about one of my all-time favorite detective series. I think you may want to read them both before continuing on with this post. The first was titled Bosch Pilot and was written all the way back at the start of February. The pilot was being made available for free for one month in order to gauge public interest. The second post was written just two weeks ago. It was titled What’s that one Series of Books You Won’t Forget? If you’ve read that post then you know that Bosch is high up on my list of favorite series, but if you haven’t then go read it. Right now. I tell you about him! Let me tell you a little about how we got to this point. Several years ago, Michael Connelly sold the rights of the first three books of his Harry Bosch series to Paramount. Long story short, not a single movie was ever made and the rights eventually reverted back to him after a lengthy legal dispute. This happened very recently. Then Amazon came into the picture and produced a pilot episode that would be made available for free for one month and then the ultimate decision would be made regarding a full season. The reaction to the pilot was overwhelmingly positive. (I watched the first day it was available) It was announced a few days ago that the series had been greenlit for a first season of ten episodes. The first season will pull from The Concrete Blonde, City of Bones, and Echo Park; which are #’s 3, 8, and 12 in the series. 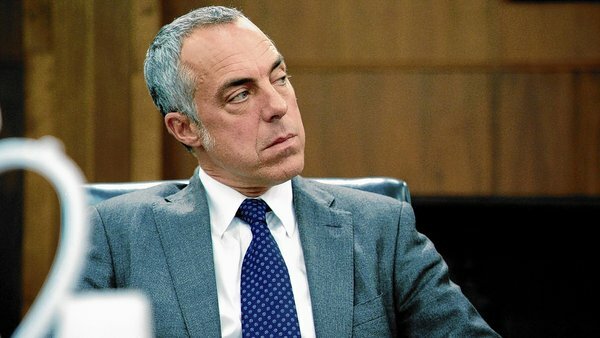 Titus Welliver is cast as Harry Bosch. And he’s phenomenal. I figure if you’ve read this far without going back and reading the other two posts then you probably won’t do so. That’s fine. Harry Bosch works as a detective for the LAPD. He joins the force after being a tunnel rat in Vietnam. The series begins in the early 90s and we read as Bosch ages in real time. I’ve never read a series written this way and I thoroughly enjoy it. Have you ever seen those cop shows that always have that one male or female who doesn’t care about the risks associated with throwing his or herself fully into a particular case? I mean, they might get hurt or there could be consequences from the higher ups within the department or they could flatly accuse the wrong person and have to revert back to square one. Now you know who I’m talking about. You see, that person is Harry Bosch. He’s the guy who might face lawsuits every couple of years because he went out and killed someone in the line of duty that may seem questionable on the surface. He’s the guy who faces suspensions without pay nearly every year because of how he handles cases. He’s the guy who simply doesn’t give a damn about departmental politicking. He cares about justice. He always acts out in a manner that he believes is right. Detective work is in his blood, and that’s why he can’t step away from the department even though he’s had ample opportunity to do so. Even if you haven’t read a single book in the series, this show will be worth watching an episode or two or all ten. I know it. Click here to visit Michael Connelly’s website for more info about the show and the books. Click here to read an article in the LA Times about the show.